Though primarily a boiler manufacturer, Barton offered 'special steam tonneau cars' built to order. 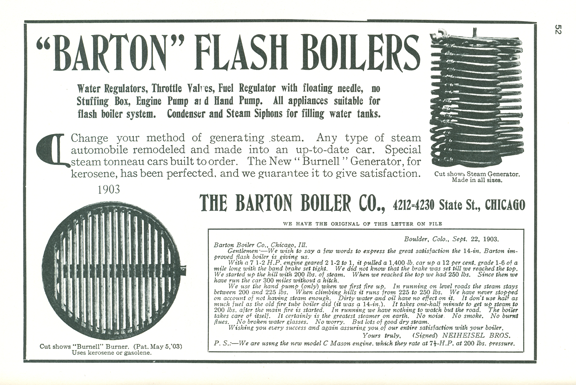 These used the Barton flash boiler, Burnell kerosene burner, and Mason 2-cylinder slide valve engine. 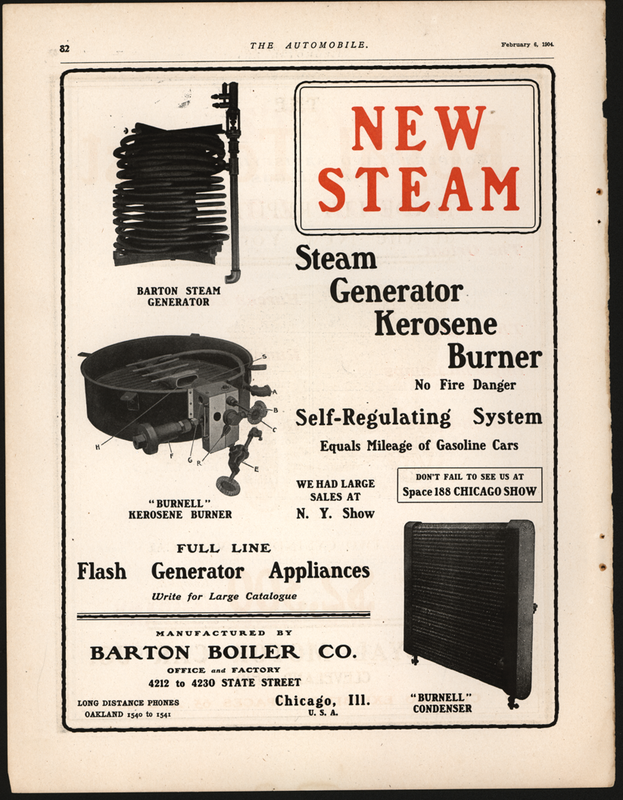 The Barton Boiler Company of Chicago, IL placed this full page advertisement in the February 6, 1904 issue of The Automobile, page 82. This 1903 advertisement is found in Floyd Clymer's Steam Car Scrapbook, p. 52. As with almost all of the illustrations and material in his Scrapbook, (a very appropriate description) Clymer lists no sources. This advertisement is found in Floyd Clymer's Steam Car Scrapbook, p. 49. As with almost all of the illustrations and material in his Scrapbook, (a very appropriate description) Clymer lists no sources. Georgano, G. N., Encyclopedia of American Automobile, (New York, E. P. Dutton & Co., 1968), p. 26. Clymer, Floyd Steam Car Scrapbook, (Bonanza Books, Crown Publishers, Inc. 1945), pp. 49 and 52.